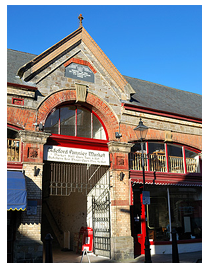 The Bideford Pannier Market is sited in the Old Town Area: follow the High Street, take a left turn along Grenville Street and there it stands, a formidable Victorian Building. The covered Pannier Market Hall with its Artisan Studios trades Tuesdays to Saturdays, open 9.00 am to 3.00 pm January to March and 9.00 am to 4.00 pm April to December; the independent Butcher’s Row and the Market Place Shops are open Mondays to Saturdays. There is a free Pannier Market Shuttle (minibus) Service every Tuesday and Saturday from Victoria Park and return, running every twenty minutes, from 10.00 am to 2.40 pm. Also, within the Market Hall the facilities include toilets (also those for the disabled), baby changing area, free Wi-Fi and a café. The Complex is dog friendly; the visiting dogs though must be walked on their lead. The inspiration behind the introduction of the Artisan Shop Units was the successful draw of the Arts and Crafts people within Butcher’s Row. Visitors genuinely liked to watch the tenants at work; the Work Shops provide that opportunity as well as a sales outlet; the variety and standard of work that is offered is worthy of note. The Market Complex offers locally and on site made gifts, pottery, wood carving, stained glass, toys, books, painting, jewellery, food outlets, opticians, Wellness Practice and Natural Living Store… It genuinely offers a covered, eclectic, independent / sole trader shopping experience; all are welcome. The Town Council operate the Market with the Market Officer working on site during Market trading; the Administrator is based in the Town Hall. The Market Pitch / Stall is approximately 6 x 3, the Stalls have candy skirts and canopies; trestle tables are still available, though. The “Casual” daily rate for a market pitch / stall is currently of £6.00. Monthly rates: two days per week: £31.00 or three to five days: £36.00; all those trading in the Market Complex must provide proof of Public Liability Insurance cover. There is also a “new trader” concession: two months for the price of one – up-front payment. The Market Hall Studio Units are £82.00 a month. Butcher’s Row Units are basic variations on a box shape and are £102.00 for a single and £163.00 for a double per month. The Market Place Shops vary in size and facilities. Prices effective from 1 April 2019.